NAC-folk, you can begin screaming now. The Installation's start-time might still be 33 hours away... but as one of the 1011 crowd put it over the weekend, "Timmytown is open for business." Indeed it is... and it already feels like New Year's. 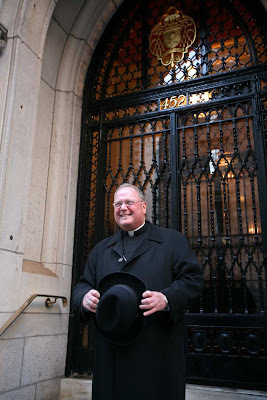 Good morning from New York and the final lap toward the city's full-stop reception of its tenth archbishop. It's just after 10 o'clock... but even now, there's news: while Tim Dolan was supposed to spend today in hiding and remain unseen until his arrival before the doors of St Patrick's Cathedral tomorrow night, the Appointed One's already started hitting the streets and talking on the TV, his 50-strong family, spiritual parents, etc. in tow. Again, it's barely 10 o'clock. And, of course, this should come as a surprise to nobody. Much can be said to open the coverage you'll see here over the week to come, but for now, let this suffice: even for all the ink and airtime to date, this town still has very little realization of the burst of energy that took possession of 452 Madison yesterday afternoon (above right), likely to remain there for two decades. And now, finally, six weeks after Appointment Day -- and close to a decade since the Roman buzz first foresaw this scenario as the Stateside church's "marriage made in heaven" -- it all begins. A restful and Happy Easter Monday to one and all -- hope your Triduum was beautiful and everything you sought... and now, just sit back, relax and enjoy the show. Oh, and as these pages are brought to you by, well, you, a ton of thanks to everyone who's lent a hand with the travel budget.